God drives Adam and Eve out of the Garden of Eden. GOD HIMSELF MADE for Adam and Eve their first earth-home. And a beautiful home it was. We shall call it a garden-home. God chose a place from which four rivers flowed and there he planted a large garden. We do not know the many kinds of trees and flowers and vegetables and grasses that he caused to grow in this garden. But we are sure that no park which man has made could be so lovely as was the Garden of Eden. In the midst of this garden God planted a wonderful tree, called the tree of, life. Whoever might eat of the fruit of this tree would live on and on forever. Adam and Eve were very happy. God had given them good things to enjoy, and they knew nothing about evil and wrong-doing. They often talked with God and listened to his voice as he walked and talked with them in the cool of evening time. We do not know how long Adam and Eve enjoyed their beautiful garden-home, but we do know that one day a sad thing happened. Sin crept slyly into this lovely place. It came first to Eve. She heard a voice and saw a serpent talking to her. She was not afraid, because she had never known fear. So she listened. “Has God said that you must not eat the fruit of every tree in this garden?” the serpent asked. Until this time Eve had not touched the forbidden tree, but now she looked at its fruit and thought that if it really would make her wise, like God, she wanted to taste it. Soon she yielded to the temptation and plucked the fruit, and then she gave some to Adam, and he too ate of it. At once Adam and Eve knew what a dreadful thing sin is. They knew they had disobeyed God. A strange something stole into their hearts; it was fear. How afraid they were to meet God! They had never been afraid before, but now they tried to find a hiding-place among the beautiful trees in the garden. Their hearts had become wicked. Soon a voice called, “Adam, where are you?” and the frightened man answered, “Lord, I heard your voice and I was afraid, therefore I hid myself.” “Why should you be afraid to meet me?” God asked “Have you eaten of the forbidden fruit?” Then Adam told God that Eve had given him some of the fruit and he had eaten it. “What is this you have done?” God questioned Eve. And she told him what the serpent had said. “I listened to the tempter and then ate of the fruit and gave it to my husband,” was her sorrowful confession. 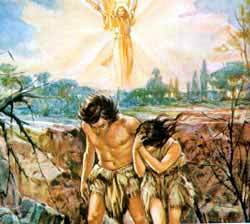 God was grieved because Adam and Eve had failed to obey him. Now he knew they could no longer enjoy his presence with them, because sin had spoiled their lives. They were no longer fit to live in the beautiful garden home he had made for them. So he sent them away out into the world to make a home for themselves. And he placed an angel at the gate of the garden to prevent them from coming back to eat of the fruit that grew on the wonderful tree of life. Adam also received a sentence of punishment from God. No longer should the ground yield freely of the fruits and vegetables which Adam and Eve ate for food; now Adam must work hard to keep these things growing. And he would find that weeds and thorns arid thistles would grow in his fields to make his work even harder. Then by and by he should grow old and feeble, and then he should die and his body would again become dust as it was before God created him. All these sorrows came because of sin. But while God drove Adam and Eve out of the beautiful garden, he at the same time gave them the promise that he would send a Savior to make all men free from sin and death.